IMAGINE travelling three thousand miles to a world championship just to end up playing against curlers from your own ice rink! The success of the rinks skipped by David Hay and Christine Cannon at last weekend’s Scottish Seniors in Hamilton means there will be eight Stranraer Ice Rink curlers on the ice at the upcoming World Senior Curling championships in Canada in April. For Ireland -Peter Wilson, PJ Wilson, Neil Fyfe and Louise Kerr. For Scotland – Norman Brown, Andrew McQuistin, Hugh Aitken and Christine Cannon. That’s half the team from both nations. But if you dig beneath the surface you unearth a long tangle of connections between these national champions as most of them are all former medal winning team-mates. And to add a bit of gunpowder to the mix, the Irish men, out to defend the world senior crown, play the Scottish men in their first game. This extraordinary encounter will take place in a – very appropriate – high noon showdown on April 13th in the Grant-Harvey Center in Fredericton, New Brunswick. So here comes the history bit…..
PJ Wilson is held aloft by his team – left to right – Andrew McQuistin, John Sharp and Neale McQuistin. 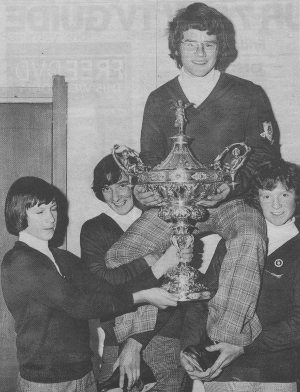 1974 – PJ Wilson wins the Scottish Junior title with Andrew McQuistin playing third stones for him. The team travel to the first ever World Junior Championships in Toronto, Canada as Scotland’s representatives where they take the bronze medal. The rest of the team was John Sharp (who now curls for England) and Neale McQuistin. Scottish Schools Champions 1977 – Stranraer Academy. Helen Wallace is held aloft by – left to right – John Sharp and Hugh Aitken with Peter Wilson below. 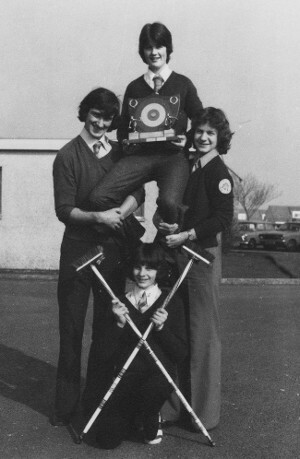 1977 – Peter Wilson and Hugh Aitken are team-mates in the Stranraer Academy team that wins the Scottish Schools Curling Championship. John Sharp was skipping the rink this time and the other member was Helen Wallace (now Vance). In the finals the Stranraer Academy team played George Watson’s School from Edinburgh, skipped by Norman Brown. 1979 – Andrew McQuistin skips his own rink to win the Scottish junior title and goes to win silver at the World Juniors in Moose Jaw, Canada. His second player is Hugh Aitken. 1980 – Andrew McQuistin retains his Scottish Junior title and wins gold for Scotland at the World Juniors in Kitchener Waterloo, Canada. His second player was again Hugh Aitken. Joining the team at third was Norman Brown. 1980 – Team-mates Andrew McQuistin, Norman Brown and PJ Wilson lose in the final of the Scottish Mens Championships. Other team member was Hew Chalmers. 1981– Andrew McQuistin attempting to win a third Scottish Junior title is knocked out in his own ice rink by a rink skipped by Peter Wilson. The new team go onto win World Junior gold in Megeve, France. (NB – Peter’s third player Jim Cannon would later go on to marry the newly crowned senior ladies skip Christine Cannon (nee Allison). 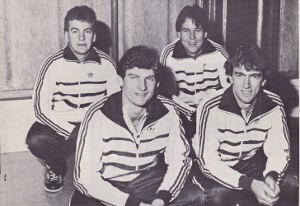 European Silver medallists 1984 – left to right – Hugh Aitken, Peter Wilson, Roger McIntyre and Norman Brown. 1984 – Peter Wilson teams up with Norman Brown and Hugh Aitken to take the European Silver medal in Morzine, France in for Scotland. The lead was Roger McIntyre. 2004 – Having moved to Ireland, Peter Wilson teams up with his namesake PJ Wilson to represent Ireland playing in their first European Championships in Bulgaria. They take silver in the ‘B’ Division. The other team members were Robin Gray, Johnjo Kenny and John Furey. PJ qualifies to play for Ireland as his father was born in Derry. 2005 – Peter and PJ play in the European ‘A’ Division for Ireland at Garmish -Partenkirchen in Germany. They come seventh. Team members were Douglas Dryburgh, Robin Gray and Johnjo Kenny. 2006 – The two Peters play for Ireland at the World Curling Championships in Lowell, USA. In December that year, the two Peters and Neil Fyfe play in the European Championships ‘A’ Division in Basel, Switzerland. 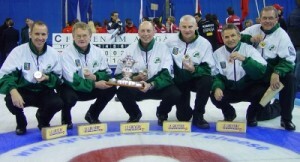 European ‘B’ Gold medallists 2007 – left to right – Neil Fyfe, PJ Wilson, Robin Gray, Peter Wilson, Tony Teirney and coach Ron Myers. 2007 – Peter, PJ and Neil win European ‘B’ Division gold in Fussen, Germany. The other team members were Robin Gray and Tony Teirney. 2008 – PJ Wilson skips Ireland in the European ‘A’ Division in Onskoldsvik, Sweden with Neil Fyfe in the team. Team members were Bill Gray, John Furey and David Smith. 2009 – Peter Wilson and Neil Fyfe play for Ireland at the European Championships ‘B’ Division in Aberdeen. PJ Wilson acts as coach. Team members were Robin Gray and Johnjo Kenny and Bill Gray. 2013 – The two Peters and Neil team up for a crack at the senior title for Ireland. They begin by knocking out the current World Senior Champions from Ireland -Johnjo Kenny, Bill Gray, David Whyte , Tony Teirney and David Hume – at a best of five playdown in Dumfries in January. History repeats itself as this is the second time Peter Wilson has put out the world champions at the start of their title defence! The Wilson team now head to Canada to take on their former team-mates in the Scotland shirt. And what a mouthwatering prospect that is. You can bet that, after a very brief handshake, no quarter will be given on either side. Because who ever wins the other team are going to hear about it for the rest of their lives back home in Stranraer. Ireland’s PJ Wilson and Scotland’s Hugh Aitken are even members of the same curling club Limekiln! 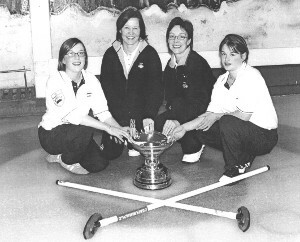 Henderson Bishop winners 2003 – left to right – Marie Heaney, Christine Cannon, Louise Kerr and Kerry Adams. 2003 – The ladies also get in on the team-mates act. Scotland’s Christine Cannon and Ireland’s Louise Kerr teamed up at skip and third in 2003 to win the Henderson Bishop the RCCC Ladies Challenge Trophy. And now Neil Fyfe’s brother, Alastair, is going to Fredericton as 5th player for England! !